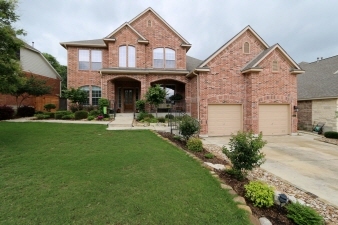 Absolutely gorgeous 4 sides brick home with all the bells and whistles! Pretty kitchen with 42 inch cabinets with crown trim, double ovens, gas cooktop, stainless appliances, granite counters & tile backsplash that opens to the extra large family room with handsome rock fireplace! Downstairs master retreat with outside access, his & her counters, corner garden tub, huge walk in shower and fabulous extra large walk in! 5th bedroom downstairs with full bath! Lots of crown molding! Gorgeous archways! Front and rear covered patio! Better hurry!